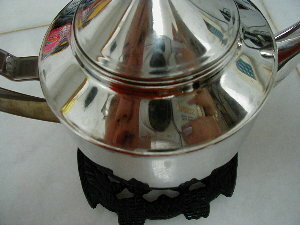 I'm reflected in the new teapot my mother bought after the 9/11 attacks. The windows to my parents' apartment were open when the planes struck the World Trade Center & dust covered everything. She decided to throw out almost everything & replace everything in the kitchen.